Legendary Japanese band Loudness are in the West to play a series of the biggest rock- en metal festivals in Europe. The gaps are filled with some club shows. Their passage in the beautiful Gebr. De Nobel concert hall is still ringing in our ears as we write this. With three bands on the bill, it was a real ‘value for money’ show. 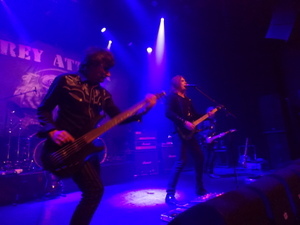 German band GREY ATTACK open the night with a handful of people in the hall. Those who came in later missed the opportunity to see a very good and tight band that rocked like their lives depended on it. They made us listen because of a perfect dynamic sound and a bunch of good songs. I don’t know how many people bought their 2014 album after their set, but We were one of them. It’s already the second time that MY OWN GHOST from Luxemburg are support to the Loudness club shows and they were the main reason we made the trip to Leiden. They just finished the recording of their second album and the shows with Loudness are the perfect place for a try out. 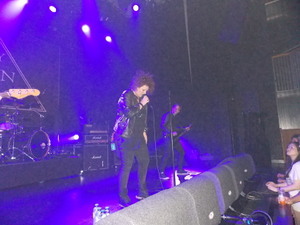 Julie Rodesch and her four man in black took the stage with a bang and rocked like hell. They played nine songs of which four were new. Julie is an passionate singer, but still has this attitude of understatement when she’s on stage. She a girl that wants the music to do the talking and the band behind her provide an energetic and manic backing. They played mostly up-tempo songs and maybe they should consider a little bit more light and shade in the flow of the set but that didn’t prevent us from enjoying this original and talented band. We are looking forward to their new CD! 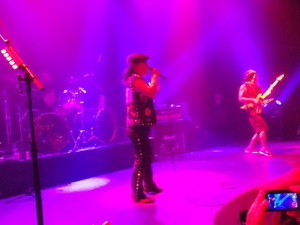 LOUDNESS already blew us away last year at Gebouw T in Bergen-Op-Zoom and they did it again in Leiden. They have a massive and loud sound, but still it’s clear and dynamic. They are touring again on the back of their latest studio offering ‘The Sun Will Rise Again’ and they have the audience at their feet. We enjoy the outstanding musicianship of the great guitarist Akira Takasaki, the funny but precise bass player Masayoshi Yamashita and brilliant drummer Masayuki Suzuki. Singer Minuro Niihara still has that powerful voice that sounds like it hurts all the time, but he doesn’t miss a note. Loudness is a fascinating band and wonderful to watch as all four members have an individuality that doesn’t prevent them to sound together like a blasting hurricane. A night full of music with three great bands, a Japanese legend included. What more can we wish for? A hug from Julie? We even got that! Lucky bastards we are!